Let go of expectations and overcome obstacles in the creative process! 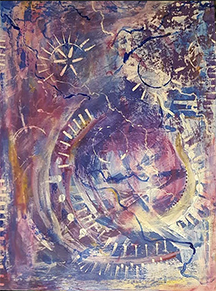 In this workshop, participants will focus on the art practice of Intuitive Painting, which adopts a bold and fearless approach to painting as discovery and self-expression. Prompts will guide you in using acrylic paint, ink, collage and other art media. Novice and experienced artists, renew your artistic spirit!